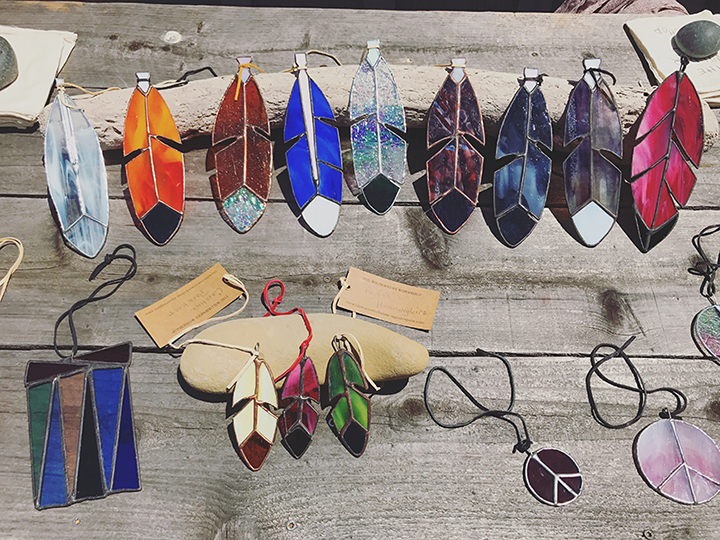 Stained glass feathers are crafted in our workshop located on the mountainside, shadowed by Seneca Mountain in the Northeast Kingdom of Vermont. All are hand cut w/copper foil with silver, black or copper patina veins. The large feather has a pearl white quill (the opal side being the right side of the feather), the small feather has a loop and both have a leather strip for hanging. The handmade glass comes from various places - each sheet of glass is unique and there may be slight variations in color. The earthy textured glass used in the Red Tailed Hawk, Rufous Hummingbird and the Cedar Waxwing is called: Youghiogheny pronounced [yok-uh-gey-nee] glass . Home of the Abernaki Indians, respect for Mother Earth still thrives in this wilderness with its' wildlife and and high elevation ecosystems. One of the nations largest migration sites is in the nearby Nulhegan Basin, South America Pond.